create a new main library somewhere else, in a setting where all the modern demands of a main library can be met without having to compromise asplund’s iconic status. but where? a new main library needs space. and space is plentiful, at a very good address for a big public library, inside the huge cultural megacenter designed by peter celsing, downtown (“kulturhuset”). the municipal repertory theater company (“stockholms stadsteater”) which resides inside the center would have to move out, of course. but perhaps such a move would bring only good things, also to the theater company. i have already argued elsewhere that the theater company’s downtown business district location of today is less than ideal for activities that take place predominantly at night: during business hours, when the streets are full of people, the theater is closed. after business hours, when the theater opens, the streets are empty. people commuting from the late night performances simply do not feel entirely safe. however, the cultural center would function very well indeed if it decided to concentrate on activities that are open during business hours. for instance: the main branch of the public library would be an ideal use for the center in its entirety. the big “black box” cube in the rear, which first was used by the national parliament (as temporary assembly hall), and today is used for the main auditorium/stage of the city theater, has room enough for both the wings, and overhead fly tower, and cellar, and workshops of the city’s largest proscenium theater (that’s how large that “black box” is!) - and could easily be transformed into an attractive main hall for the library (lit by day from skylights overhead, just like the parliament assembly hall was), plus - below the the floor of the new main library hall - several floors of extensive storage space for books and other media. as i’ve explained earlier, the small, mediatech-ish branch of the public library which already functions inside the center is really the only (!) permanent success story of the center since its opening. the library inside the center was always popular. it was popular when the center first opened (library then located on ground level, reachable directly from the piazza). it is popular now (after having moved up two flights of stairs). apparently, ground floor or upstairs does not matter: all parts of the complex would function very well as parts of the new main branch of stockholm’s municipal public library. critics of the recent architectural library competition have suggested the “slussen” neighborhood as the best alternative site in the inner city for a new main library branch (if those in power were to decide to not add to asplund’s library at all, and instead go to look for other possible sites in the inner city of stockholm): there is a nice waterfront view, for starters, at slussen. most public buildings look great on the waterfront. i find “kulturhuset” to be a better choice, better than slussen: not only is kulturhuset already an established, and a popular site for a public library branch (albeit at a modest scale up till now) - relocating to slussen would never (!) work: those of us who have been around a while remember a proposal for a new, larger sized building complex near slussen which was praised for its architectural qualities, but never came to be, anyway: the “mynningsladdaren” project, designed by bengt lindroos (1980s, affectionately called “the cheddar cheese on stilts” in its day). neither was any of the acclaimed designs by sven markelius (1960s and 1970s) for a city theater on the waterfront at slussen ever built. 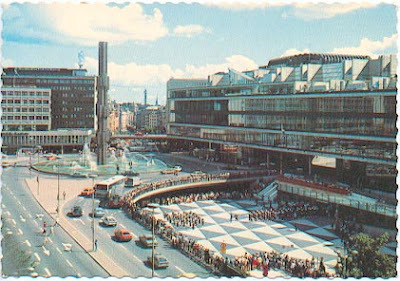 we who remember know that proposing an even bigger building in or near the scenic waterfront setting of slussen would never come to fruition. public opinion, and politics, would reject any such proposal. but as we’ve already seen: luckily, the big empty spaces and floor surfaces that a modernized main library branch craves do in fact already exist, at an address we already know functions very well for a library: inside “kulturhuset,” the municipal cultural center downtown. so, if we move the city theater out of the cultural center, where would we move it? would “slussen” be a possibility? unfortunately the sheer size of a new city theater building, with fly towers and all, would have the same problem coming to fruition near scenic slussen as a library building would. 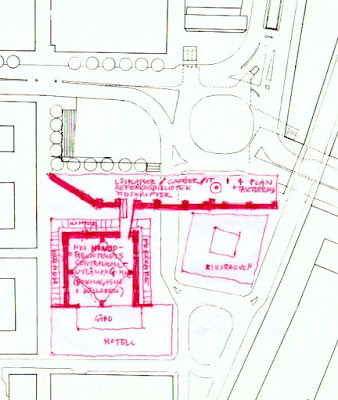 a new theater building at “slussen” would never happen (just like a new public library in slussen would never happen). please note! it’s not the responsibility of the stockholm city repertory theater company to make the downtown business district, or slussen, “come alive” again! let the good people at the city theater focus on doing what they do best: on doing theater, not urban renewal! let the police, and let city planners and politicians worry about dead streets and violence and crime downtown. instead bring the theater to where people would be happy to go, also at night. i propose the plot next to gunnar asplund’s iconic library as the new location for the city theater company: the neighborhood is alive night and day. the site is large enough for the city theater. since there would be no need for a new theater complex on this site to connect physically with asplund’s library building, the space between existing library and new theater can be cleared, and used for a plaza, or for extending the park landscape that surrounds asplund’s library - this possibility will calm anyone who worries about asplund’s library’s future silhouette being compromised by a new major addition. (1) the big volume of new main branch of the public library fits inside the already existing “kulturhuset” cultural center - no problems with a new building that “looks too big.” and the library as institution gains more from such an address downtown than at “slussen,” or next to asplund’s library for that matter. 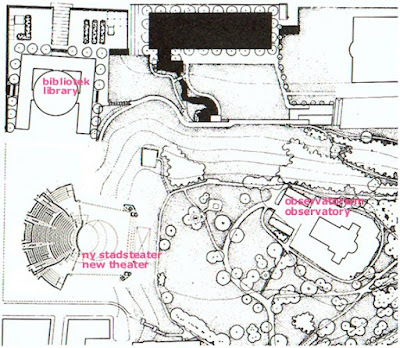 (2) when the main library branch relocates downtown, a new proscenium theater for the city theater can be built in the spot first meant for the library extension. the city theater as institution would gain from moving to the neighborhood that surrounds asplund’s library, because it is pleasant and safe also at night. the city theater would this way manage - at last - to get away from the dead street scape at night downtown. (3) when the city theater moves away from the empty streets downtown, something can be done about the awful, ruined interiors inside peter celsing’s cultural center. the dignity of “real architecture” can be brought back. the kitsch can be thrown out. (4) and, as i have already suggested elsewhere: tearing down the first addition to asplund’s library, to once again expose the exterior of the rotunda - all the way from the top to the ground - should be made a prerequisite in the reinventing process that will have to take place after the main branch of the library has moved downtown (reinventing asplund’s library as - yes what? exciting to toy with ideas such as - a good space for a museum of architecture and/or design? maybe the “functional” days for asplund’s icon are over. maybe it’s time to let it be “just” architecture). tearing down the fourth side of the square would bring back the architectural drama of the library that has been hidden away ever since the library was added-on-to the first time. it’s now official: there will be no addition to gunnar asplund’s famous stockholm public library. “too expensive” city officials say. a welcome turn of events: architectural critics rejoice. but the main branch of the stockholm city library still needs a new home. the asplund building is simply too little.